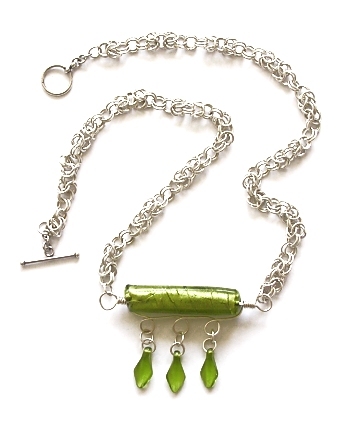 Made as a variation in my Wire and Bead Centrepieces series, this necklace was made to demonstrate that the focal beads used could vary in size and shape. The centrepiece hangs from a Byzantine Chain which I also made to show that the centrepieces don't have to be strung as the previous pieces are. This piece also has a set of matching earrings.